Ancient Greece: Hermes the messenger between the Gods and humans. 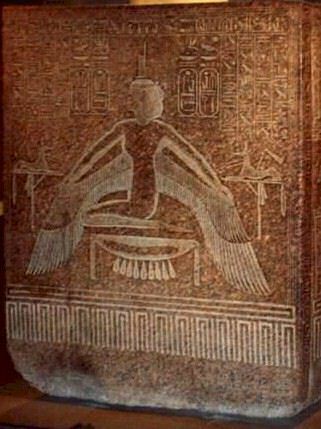 Ancient Egypt: the Goddess Nepthys and images of Isis (see picture right). Griffins: winged animals with human heads. Many cultures had winged lions and bulls with human heads. Known to the Vikings as valkyries, Greeks as horae, Persians as fereshtta and Hindus as apsara. In Abrahamic traditions i.e. Judaism, Christianity and Islam, (whose heritage comes originally from Abraham) there were no wings mentioned on angels until the time of the Roman Emperor Constance. There is no mention of wings in the scriptures. When ever an angel appeared they took a human form and only revealed their true identity after their task was complete. Early Christian artists depicted angels as human. Wings (and halos) were added by classical artists in medieval times, in order to convey their superiority and majesty. People liked the idea, so it stuck. Circular halos: angels as an offshoot of the Divine. In the latter part of the middle ages, circular halos became the norm. It is now understood that the wings and halos seen by others are the expanded auras, radiating from the crown of these mighty beings of light. Often in visualizations angels are perceived as being of human appearance or with feathery wings (not skin). Biological science would maintain that angels as portrayed in the classical pictures would be unable to fly unless their wings were at least forty feet across and they had huge breast bones and muscles to flap them. As angels are such high vibrational beings, it is unlikely they would actually need wings to fly. They are more to help with human acceptance and expectations. As a human starts to develop their own angelic qualities and bring them into their own lives (for example unconditional love, compassion, harmony etc) it is not uncommon for those who are sensitive to their bodies and to energies in general, to be aware of a tingling, warm sensation along the upper part of their spines, along with a feeling that they have wings growing from their backs. If this happens to you, do not be afraid, you are not changing into an angel, but your aura is expanding with the increased angelic qualities you are experiencing in your life. ~ Raise the energy of the room with candles, incense, angelic music. ~ Sit quietly alone in a centred, relaxed state. ~ Focus your attention on the top part of your spine and be aware of any sensations or feelings in that area. ~ Imagine your wings unfolding, stretch them, flap them, imagine them enfolding someone, perhaps someone who needs healing, exercise them. ~ Feel what they are like, their size, shape, texture. The more they are acknowledged, the easier it is for the angelic qualities to come into your life. When you are finished remember to fold your wings up again. This story was sent to me several years ago. Unfortunately I don't know where it came from or who wrote it. If it was you then I thank you very much and I apologize for not being able to acknowledge you properly. There was this little girl sitting by herself in the park. Everyone passed by her and never stopped to see why she looked so sad. Dressed in a worn pink dress, barefoot and dirty, the girl just sat and watched the people go by. She never tried to speak. She never said a word. Many people passed by her, but no one would stop. The next day I decided to go back to the park in curiosity to see if the little girl would still be there. Yes, she was there, right in the very spot where she was yesterday, and still with the same sad look in her eyes. Today I was to make my own move and walk over to the little girl. For as we all know, a park full of strange people is not a place for young children to play alone. As I got closer I could see the back of the little girl's dress was grotesquely shaped. I figured that was the reason people just passed by and made no effort to speak to her. Deformities are a low blow to our society and, heaven forbid if you make a step toward assisting someone who is different. As I got closer, the little girl lowered her eyes slightly to avoid my intent stare. As I approached her, I could see the shape of her back more clearly. She was grotesquely shaped in a humped over form. I smiled to let her know it was OK; I was there to help, to talk. I sat down beside her and opened with a simple, "Hello". The little girl acted shocked, and stammered a "hi"; after a long stare into my eyes. I smiled and she shyly smiled back. We talked until darkness fell and the park was completely empty. I asked the girl why she was so sad. The little girl looked at me with a sad face said, "Because, I'm different". I immediately said, "That you are! "; and smiled. The little girl acted even sadder and said, "I know." "Little girl," I said, "you remind me of an angel, sweet and innocent". She looked at me and smiled, then slowly she got to her feet and said, "Really?" "Yes, you're like a little Guardian Angel sent to watch over all those people walking by". She nodded her head yes, and smiled. With that she opened the back of her pink dress and allowed her wings to spread, then she said "I am. I'm your Guardian Angel"; with a twinkle in her eye. I was speechless - sure I was seeing things. She said, "For once you thought of someone other than yourself. My job here is done". I got to my feet and said, "Wait, why did no one stop to help an angel? "She looked at me, smiled, and said, "You're the only one that could see me"; and then she was gone. And with that, my life was changed dramatically. So, when you think you're all you have, remember, your angel is always watching over you. Every one of your friends is an Angel in their own way. The value of a friend is measured in the heart. I hope your Guardian Angel watches over you always.